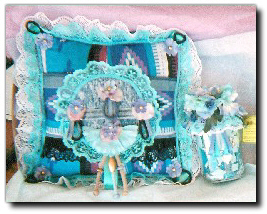 Country décor pillow and mini pillow. White lace border and yellow and burgundy flowers and bows. 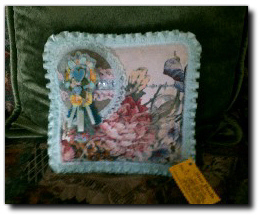 Country Victorian décor pillow, with country bottle with pin cushion top. 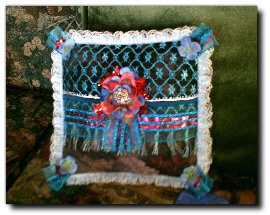 White lace border, blue center and blue flowers and black and white ribbon. Also a magnet. 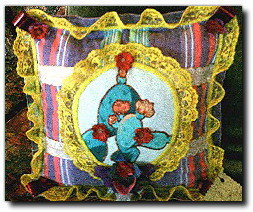 Country décor pillow and bottle with a pin cushion top. 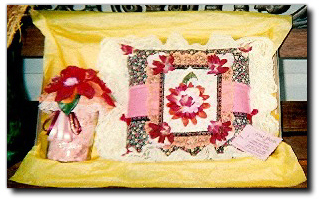 Patchwork with burgundy, pink and coral flowers and ribbons and white lace border design. 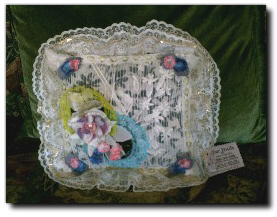 lace, center beautiful white doily with bouquet of purple, pin and lilac flowers and light lilac flowers in corners. 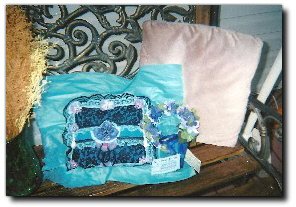 Country décor pillow and lilac candle. 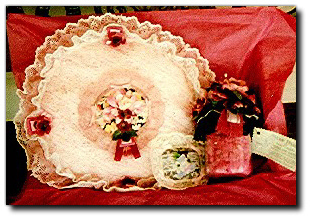 Coral and white lace border, round center, lilac, blue and pink flowers. 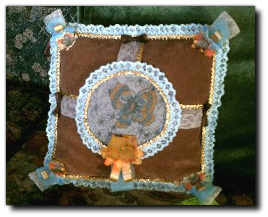 Victorian square décor pillow. Black and white lace border, black lace bands across black bows. Center yellow, white, pink flowers with rhinestone beads. 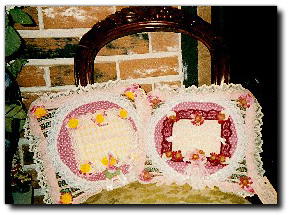 Victorian décor pillow with white lace border. 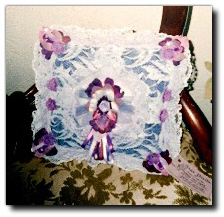 Center white lace over purple with purple, pink, white flowers and pink and purple ribbon. Rhinestone center. 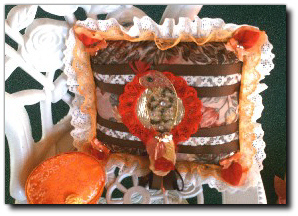 Country decor pillow and bottle with pin cushion on top. Yellow and white lace border and white lace center. Yellow and white flowers. 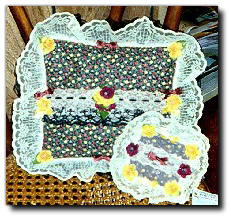 Country twin decor pillow set. Pink and white lace. Center circle, burgundy and yellow square centers with burgundy and yellow flowers. Victoria Round Decor Pillow and bottle with pin cushion on top, and a magnet. 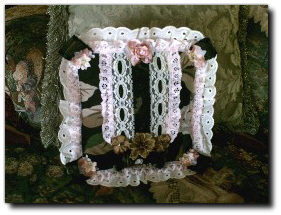 Two toned pink lace border, white lace with pink center overlay. Pink, white and burgundy flowers and burgundy ribbon. 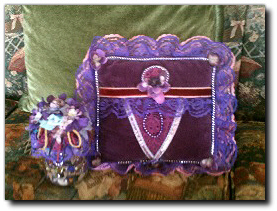 Victorian Decor Pillow Set with bottle to match (with pin cushion on top), lilac and purple lace border, two tone purple velvet background, burgundy velvet bar across, silver "V", lilac, purple and white flowers and purple beads. 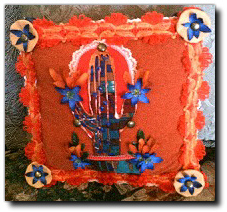 Arizona sunset colors with orange and beige border, cactus with cobalt blue flowers, also on all corners, blue ribbon and copper nail heads. 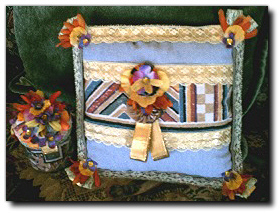 Blue denim background with southwest bar across, metallic gold ribbon trim around the border, corner blue, gold and purple flowers, and bottle to match (with pin cushion top). Southwest background design. 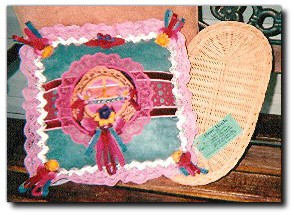 Circle has cactus appliqué, lime green lace border with burgundy flowers and beads. 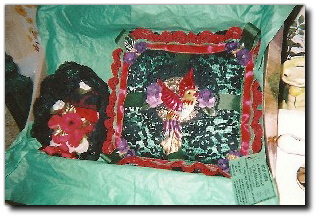 Large pillow with blue denim background, wide red cotton border, bar across with many nail heads and rhinestones, red and white flower with red, white and blue ribbon. 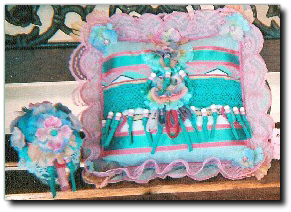 Southwest turquoise background design, white and turquoise beads with fringe, center pink, blue and lilac flower with lilac lace border and blue flowers in corners. Bottle to match (with pin cushion top). Blue denim background, cross bar burgundy and pink lace with silver rick-rack and nail heads on border, center pink, gold and silver circle with pink lace around it, yellow and burgundy flower and ribbon. Includes the basket tray. 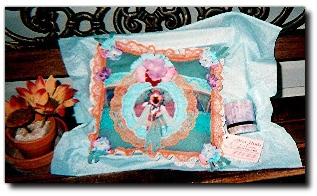 Two toned blue and white southwest background design, white and blue lace border, circle with blue lace border and blue, purple and pink flower, black loops on corners, center with blue ribbon and beads, Bottle to match (with pin cushion top). 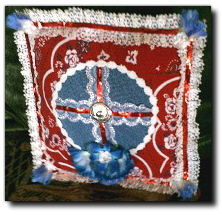 Blue denim background, triple circle across, red lace borders on two with white lace around center circle, blue flowers and red ribbon. Bottle to match (with pin cushion top). 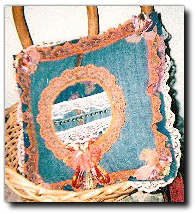 Blue denim background, salmon and white lace border, center circle with white lace across with blue denim bar and nail heads, pink, salmon and white flowers and ribbons. 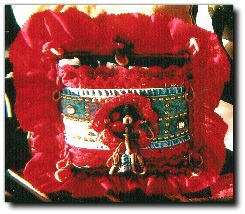 Multi-colored tie-dye background colors with orange lace border, red, blue and purple flowers and ribbon, and beads and Bottle (with pin cushion top). 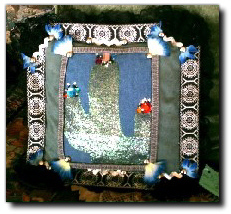 Large blue denim background, two inch black lace with silver inlaid medallion square border, center cactus design silver and green with red, pink and turquoise jewels, blue and white flowers, silver rick-rack in corners. 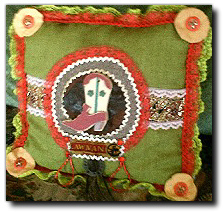 Green linen background, red and lime green lace border, center bar, gold bar with white lace, center circle with boot, red lace border with white rick-rack, "Lawman" on leather below boot, tan circle in corners with red jewels and copper nail heads. 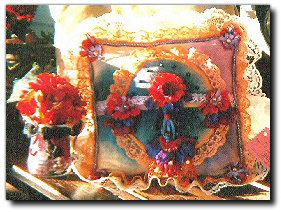 Southwest fabric design background, green and white lace border, square inner border silver and white ribbon, center circle orange lace border, blue denim and multiple beads, purple and orange flower and nail heads. 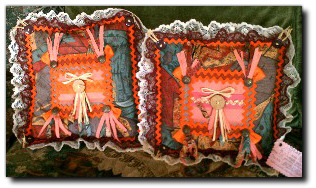 Arizona sunset multi-colors background, pink and burgundy lace border, center squares with orange rick-rack, center wooden button with straw bows, copper nail heads in corners and on fringe, orange rick-rack inner border. 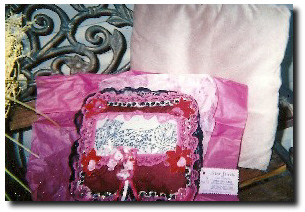 Purple and pink tie-dye background, fuchsia and white lace border, inner square pink sequins, small triple circles across top, large rhinestone centers with fuchsia lace border and center with pink lace, purple fringe, copper nail heads, purple semi-circle, wide lace, purple, pink and blue flowers. Large bottle to match (with pin cushion top). 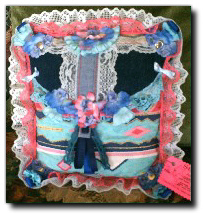 Navy blue denim background and multi-color southwest design, two tone pink lace border, with lace center trim, pink and blue flowers, navy and light blue ribbon, pink bows. 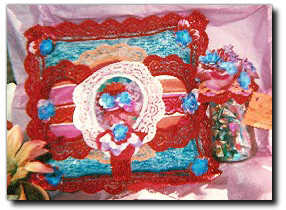 Red and white bandana background, white lace border with red metallic ribbon, blue denim inner circle with silver medallion and blue and white flowers with silver nail heads, white braid circle border. Dark blue and light blue double lace border. 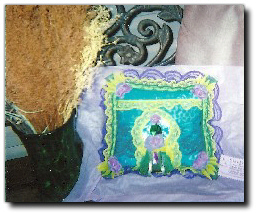 Center bar light blue velvet with blue jewel and flower in the middle and blue and white flowers and decor to match. Burgundy and pink double lace border, burgundy velvet background, pink and burgundy flowers and ribbon. 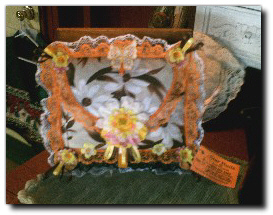 Dark brown background, center circle and outer border with white and silver lace, corners with large silver ribbon loops, orange and gold flowers and gold ribbon. 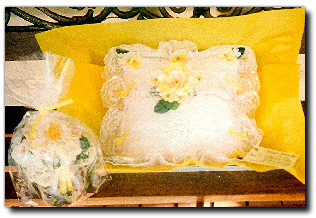 Beautiful parrot decor pillow set has lots of brown, silver and gold lace in background, orange and ivory lace border, orange and gold flowers and oval jewelry box to match. 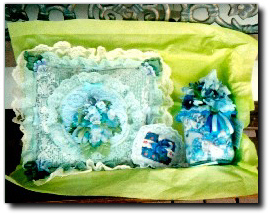 Oriental blue decor pillow, navy and lime green lace border, center circle lime green and gold lace with large green oval jewel, lime green and dark green flowers and ribbons. Red and gold Chinese bird decor pillow set. Background white velvet with overlay of black lace, red and black double lace border, black and red flowers and a bottle to match. Large Asian bouquet decor pillow, multi-color oriental background, rippled double satin blue ribbon border, left upper side flowers are aqua blue, peach and gold. Oriental print tapestry background, white eyelet with lace border, center bars are black velvet ribbon in white lace, light pink corner flowers, metallic copper flowers at the bottom. 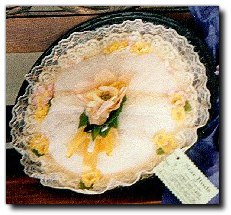 White daisy and brown chiffon background, wide two tone orange lace border, light yellow corner flowers, white and yellow lotus flower in the middle. Oriental print background, border double black lace, center beautiful white doily with bouquet of purple, pink and lilac flowers and light lilac flowers in corners. 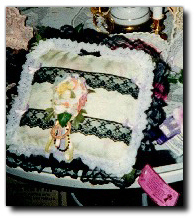 White oriental lace over black velvet background, wide white and gold metallic double lace border, bouquet on left bottom, metallic multi-color flowers with yellow butterflies, corner lilac flowers. 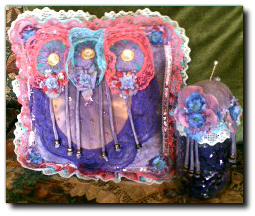 Metallic blue lace over blue velvet, center bar metallic blue with silver and blue fringe border of double silver lace, blue flowers in corners, center flower is fuchsia with silver sequined center.